November 01, 2013, 8:56 a.m.
Movember is an annual campaign that aims to raise funds and awareness for men’s health issues through growing moustaches just for the month of November. Since its inception in 2004 it has gone from strength to strength, with 3.05 million participants having raised £276 million so far. This year almost 120,000 British men have registered to be &apos;Mo-Bros&apos; on the official Movember website. Research shows that a there has been a sharp rise in public awareness of the scheme. 74% of the public have heard of Movember this year, compared to just 26% in 2010. Awareness is particularly strong amongst young people with 90% of 18-24 year olds and 88% of 25-39 year olds aware of Movember. Despite the growing popularity of Movember, moustaches themselves remain rather less popular. People with a negative impression of moustaches (38%) outnumber those with a positive impression (17%) by more than two-to-one. 42% have neither a positive or negative impression. Besides &apos;moustache&apos;, most commonly associated words with moustaches are &apos;hairy&apos;, &apos;old-fashioned&apos;, and – in a further sign of its growing recognition – &apos;Movember." One of the goals of the campaign is to encourage men to be more open about personal health issues, and our research confirms that men still lag behind women in this respect. 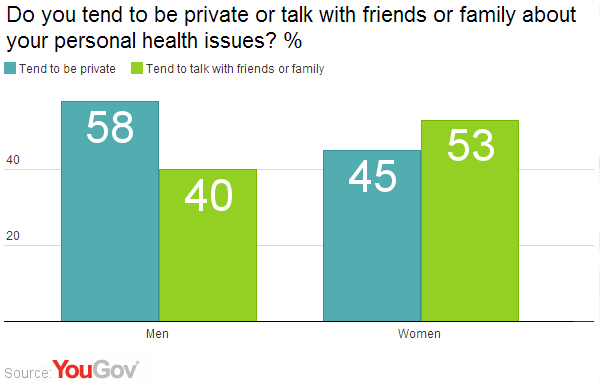 Just 40% of men say they talk about personal health issues with friends and family, compared to 53% of women. Whereas 58% of men say they tend to be private about personal health issues, compared to 45% of women. Movember began in 2003 with a group of friends in Australia growing moustaches to raise awareness for prostate cancer. The Movember foundation was founded in 2004 as the movement spread through Australia and New Zealand and has been growing across Europe and North America since 2007. UK moustache-growers raised £27 million in 2012.